Marsters Presesrve and its neighbor Gummere Woods are 85 acres in all and wrap the northern shore of Lake Ripple at the base of Brigham Hill. Gummere Wood (pronounced "gummerie" as in "reverie") has been in the Trust since 1963, and the Marsters parcel was a gift from the Marsters estate in 1993. Access is from a small parking area at the corner of Wheeler Rd. and rte 122/140, just north of the bridge over the Quinsigamond River. There is also access from the Lions Club soccer field off Brigham Hill Rd. The main trail follows the edge of the lake, passes through the pine grove, and continues along the lake to the Lions Club property. There is also a loop around the large holding basin that was created to receive and dewater the dredging material from Lake Ripple. A branch trail follows a narrow right of way up to Brigham Hill Rd. There is also access from the Lions Club soccer field off Brigham Hill Rds. In 1963, Martha Marsters, one of the charter members of the Grafton Forestry Association, had a vision of a preserve, in the heart of the town, "of educational and for use by teachers and pupils in Grafton schools" (which stand within view of the property). 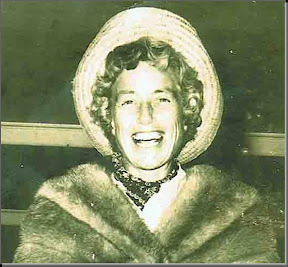 Martha worked hard to help the Forest Association acquire the first piece of this land, which was designated as "Gummere Wood" after the two families that assisted in its acquisition with generous donations. 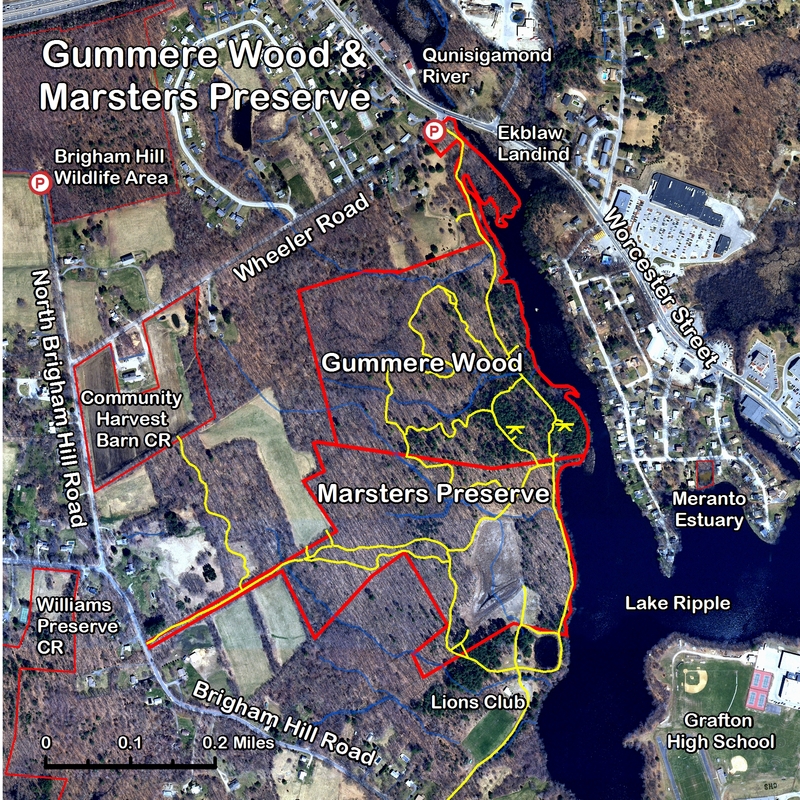 In 1993 a gift from the Marsters est ate allowed the purchase of an additional 48 acres with over 1100 feet of shoreline adjacent to the original Gummere Wood property. When the Marsters/Gummere Wood Preserve is combined with the Lions Club land, Town Conservation Commission land by the Lake Ripple Dam, and the Hassanamisco Reservation, the entire north side of Lake Ripple is preserved from Wheeler Rd. to Brigham Hill Rd. This property along Wheeler Road was owned in 1800 by Leonard Wheelock, who married Persis Brigham, daughter of William Brigham of what is now 128 Brigham Hill Road. They built the house that still stands on 11 Wheeler Road around 1804. The property was passed on to their son who held it until sometime after 1870. Sometime thereafter it was acquired by Fredrick Stockwell, a farmer, who held it until the beginning of the new century. In the early 1900s it was bought by Clinton Marshall of Worcester as a retirement home. His daughter established "Bridgenook" a tea room on what is now GLT land in the mid 1920s to serve riders waiting for the trolley to Worcester. The Marshalls operated an extensive orchard, with up to 1,200 apple trees. The fruit was sold at a farm stand on Worcester Street on the other (east) side of the Quinsigamond River. The Marshalls lost the farm in the depression and the property was purchased in 1935 from a bank by Dr. W. Elmer Ekblaw, a geography professor at Clark University. The foundation and a set of concrete steps from the Marshall Farm Tea Room remains just to the right of the trail near the Wheeler Road entrance. The age of the forest suggests farming was abandoned in the early-to-mid 20th century. There was logging at some point as well, since the multi-trunk red oaks that can be noticed along the trail are the result of sprouting from stumps. The property includes the foundation and stone chimney of a small cabin and the remains of a small dam and sawmill. The property borders Lake Ripple, originally known as . The dam, the first to impound the waters of the Quinsigamond River, dates back to the 18th century.